These classic corsage orchids are showy and often fragrant. Because they need to thoroughly dry between waterings, they are a great choice for people who sometimes forget to water. These come in oranges, purples, pinks, reds, yellows, and whites. Give them bright light with some full sun. Leaves should be medium-green. Water them once every week or two. Give them warmth and regular fertilizer. These are large, cool growing orchids with grass-like leaves from the Himalayas. They grow well on the US Pacific coast and other Mediterranean-type climates. Some miniature varieties need warmer temperatures. They come in reds, browns, yellows, pinks, greens, and whites. Give them bright light with some full sun so the leaves are light green. With cooler temperatures and adequate watering, Cymbidiums can handle full sun. They need a temperature drop of 20°F/10°C at night. They like heavy water and fertilizer in spring and summer, and less in fall and winter. Cymbidiums dislike repotting. Repot only when the plant is pushing out of the pot. 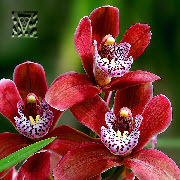 This is a large genus of orchids with varied growing needs. Many come in pinks, purples, yellows, whites, oranges, and reds. The most common kinds need bright light, including some full sun. They enjoy intermediate to warm temperatures (55°-60°F/12°-15°C minimum at night. Give them heavy water and fertilizer, and winter dormancy. Light - Give orchids bright light, but no direct sun. Water - Water them thoroughly once or twice a week -- more when it's warmer, less when it's cooler. Make sure the water drains completely out of the holes at the bottom of the pot. Never leave the plant sitting in water! Fertilizer - Fertilize them when they are growing. Air movement - Provide gentle air circulation for the plant. Proper temperatures - Keep the daytime temperature between 65°- 75°F /18°- 24°C with a nighttime temperature drop of a few degrees. Scale - These small, immobile brown lumps on the stems, leaves, or flowers can become a persistent problem. Aphids - Soft-bodied, small insects can be green or black. They usually attack new leaves or flowers. Mealybugs - These white parasites look like little pieces of cotton. Spider mites - While these insects are too small to see, they can still cause a lot of damage. Fine webs on the undersides of leaves and a bronze or yellow color to the leaves can indicate their presence. They like dry air, so keeping the humidity high will discourage them. Snails & slugs - These can eat leaves, flowers, or roots. Viruses - Unfortunately viruses in orchids are difficult to identify and are usually incurable. Symptoms to watch for include deformed flowers, streaking patterns on leaves, and deformed growth. Discard infected plants. Pets - Some animals do not bother plants, but others may chew them. Keep plants out of reach. Protect new flower spikes.